Located in desirable Club Section of Shaker Hts, this Gracious Brick Georgian Colonial has modern amenities yet lovely original characteristics that can be seen throughout to keep that desirable charm. Natural light floods every room through magnificent Leaded Glass Windows. Beautiful Hardwood Floors. Updated Kitchen w/ Stainless Steel Appliances & Butler's Pantry. Formal Dining & Living Rms. Beautiful Fireplace enhanced by Recessed Lighting. All season Garden Room & Library. Upstairs, the Master bedrm opens to an updated large bath w/ oversized soaking tub & separate walk-in shower. 3 additional bedrooms w/ 1 full and 1/2 bath on 2nd. Open Stairway to 3rd floor (additional ~800 sq ft not listed) you'll find an additional 2 spacious bedrms & Updated Bath. Recently Remodeled (1,000 sq ft) Rec Rm w/ FP, waterproofed basement, 250 Amp Electrical Service (lines buried), 2 Car Carriage House Garage, Private Yard, Garden Sprinkler System, Paver Patio and much much more! 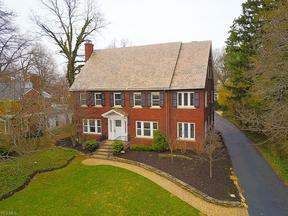 Close to University Circle, CWRU, Museums, Hospitals and the New Van Aken District. Green line rapid, library, parks, trails, playground and country club close by. A must see!